See Program of Studies to view the Odd Year/Even Year topic outline pgs 35-36. Grade 6 students at Hingham Middle School participate in the DARE program. DARE is a preventative drug education program presented by Officer Rob Ramsey of the Hingham Police Department. DARE is intended to stop drug use before it begins and the curriculum teaches techniques aimed at resisting peer pressure and helps children “say no” to drug, alcohol and tobacco use. The sixth grade DARE program is organized into eighteen 45-minute lessons, one day per four-day cycle for one-semester. Each week the students learn lessons and techniques to resist tobacco, alcohol and drug offers. Students are taught how to identify peer pressure and eight ways to resist a drug offer. Students learn about self-esteem and how to feel good about themselves after they have been able to “say no” to drugs. At the end of the school year, all 6th grade students take part in a DARE culmination ceremony at Hingham Middle School. 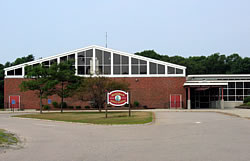 The DARE program is presently being taught in grades 5-8 in Hingham Public Schools. Booster lessons at the high school are being implemented by the health teacher.